How much do you your leaders care about you? 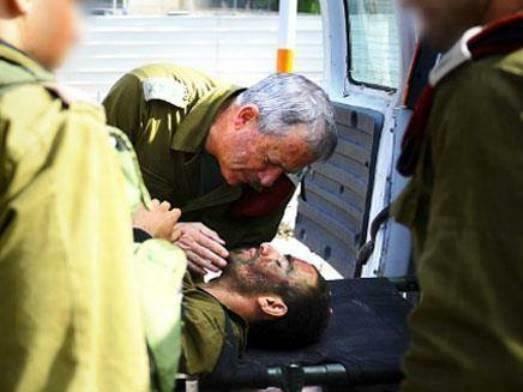 I recently saw this image making the rounds on social media to underscore the contrast between the IDF leaders who care for and protect their soldiers vs. the Hamas leaders who hide underground (or in Qatar), sending their fighters to attack Israel on suicide missioIDF Chief of Staff Benny Gantz evacuating a wounded soldiern while they remain safely away from the battlefield. Hamas puts weapons in the hands of children and the mentally impaired, sending innocents in to the line of fire while they hide. Hamas feels this is a legitimate way to combat the IDF. Israelis find Hamas behavior towards the innocents of their own society horrifying and disgusting. The story behind this image is even bigger than the simple comparison of the caring commander in contrast to Hamas. 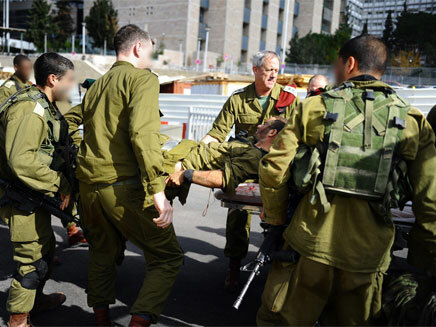 In the image you can see Israel’s IDF Chief of Staff Benny Gantz evacuating a wounded soldier. This scene is not from Operation Protective Edge; in fact it happened in 2012. At the time, the Chief of Staff had been onsite, inspecting a routine military training session. Finished, he got in his helicopter and took off for the next task he had to complete. On the radio he heard the soldiers on the ground calling for medical evacuation of one of the participants in the training exercise. The soldier had been injured by shrapnel and needed immediate medical attention. IDF Chief of Staff Benny Gantz ordered the helicopter to go back, land and pick up the soldier. It wasn’t his job, he had other important places to be, people were waiting for him, people were travelling with him (the Chief of Staff always travels with an entourage) but Benny Gantz knew that because he was so close, he could get the soldier to the hospital faster than anyone else. He also knew that time could be the deciding factor between life and death. Gantz’s helicopter isn’t made for carrying the wounded so he ordered some of his entourage to get out, to make room for the soldier. The Chief of Staff took the soldier to the hospital. Gantz could have turned the soldier over to the hospital staff and gone back to his schedule but he did not. Instead, Gantz helped unload the soldier and stayed with him until he saw that the doctors had begun the necessary medical treatment. A year later the soldier met the Chief of Staff by chance. Gantz was in the middle of talking to a group of people but when the soldier introduced himself in order to thank him, Gantz remembered him, immediately stopped everything else he was doing, pulling the soldier to the side and questioned him about his health, making sure that he had healed completely and is now ok (he is!). In Israel there is no such thing as “leading from behind.” Real leaders get their hands dirty. They take responsibility. And most of all – they care.